Fletcher Cox exited last week's game with a calf injury and did not return. Coach Doug Pederson initially called Cox "day-to-day" with this injury but it was later reported he's more "week-to-week." Reading the tea leaves here tells me that Cox is likely to miss this week, so have a backup plan ready. Second-year player Noah Spence dislocated his shoulder in last week's game and played just 21 snaps. This is an injury he will play through, but it's quite likely to limit his production moving forward as he will need to wear a harness. We should downgrade our outlook on him until he proves otherwise. Lavonte David suffered a medial ankle sprain and is considered "week-to-week." He did not practice Wednesday and unlikely to play in Week 4. Jordan Hicks injured his ankle early in the Eagles' game against division-rival Giants and did not return. He did practice Wednesday though and looks like he will play in Week 4. Sean Davis hurt his ankle in the Steelers' Week 3 game against the Bears. Mike Mitchell replaced him in the starting lineup and posted an 8-1 tackle line. Davis did not practice Wednesday and is looking like he may miss this week's game. If this is the case, Mitchell becomes a viable DB3 streaming option for the week. Quintin Demps fractured his left arm last Sunday. The team has not yet confirmed if he will undergo season-ending surgery. Even if they decide to go the non-surgery route, he will miss multiple weeks. Adrian Amos will fill in during his absence. Tavon Wilson missed last week's game with a shoulder injury which opened the door for up-and-coming safety Miles Killebrew. Killebrew responded by leading the team in tackles with nine and projects as a strong fantasy play again this week if Wilson can't suit up. Calvin Munson started another game at middle linebacker in replace of the injured B.J. Goodson; however, he was quickly replaced by Keenan Robinson who wound up playing 70% of the snaps. Goodson is likely to return this week, but if he doesn't, Robinson would be the guy to target. The Dolphins lifted the team-imposed suspension on Lawrence Timmons. He was likely dropped in a lot of leagues and is worth consideration as an LB3-. The Titans continue to rotate all three of their inside linebackers (Avery Williamson, Wesley Woodyard, and Jayon Brown). This past week it was Williamson who saw the biggest decrease in playing time as the team looked to get Brown more snaps. Although Woodyard has produced very well this year and is worth a look as an LB3-/LB4+ play, he's still only a part-time player. This is a situation I would avoid for fantasy purposes until someone establishes themselves as a clear every-down linebacker. Kenny Vaccaro was back to playing full-time after being benched the week prior. I think the benching was meant to serve as a wake-up call to both Vaccaro and the defense after their poor play to begin the season and that Vaccaro should be back to being in the lineup full-time moving forward. He was dropped in a fair share of leagues, so if he's out there and you are looking for a dependable DB2, Vaccaro is a good option. Marcus Maye was a popular pickup last week after two solid tackling games in a row and a favorable matchup against the Dolphins. So owners were quite disappointed with his Week 3 performance in which he generated zero fantasy points. He was on the field for all 63 defensive snaps, which is even more frustrating. 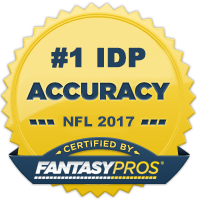 Matthias Farley was one of IDP's hottest waiver wire adds after two very strong weeks of tackle production. However, his playing time has been sporadic so far this year and he saw his snap percentage cut from 100% down to 66% from Week 2 to Week 3. He's still a player with unique upside while Clayton Geathers is out, but he remains a risk to start as we just don't know how much he will play from week-to-week. Glover Quin currently leads all fantasy DBs in points scored after the season's first three weeks. Although he's had decent tackle numbers during this time, his points are heavily inflated by two interceptions and a defensive touchdown. His tackle numbers will decrease once Jarrad Davis returns and Quin will once again revert back to a big-play reliant option at DB. He did have a seven interceptions season a few years ago so he could finish as one of the more valuable fantasy DBs. However, I tend to prioritize higher floor, tackle-producing DBs so he remains more of a DB3 option for me moving forward. DE William Gholston (TB) - Gholston has never surpassed 3.5 sacks in a season during his career, but he remains one of the league's premier tackle-producing defensive ends. He already has 13 total tackles through two games this year and is a sneaky add in deeper IDP leagues that reward heavily for tackles. DE Alex Okafor - Okafor, a former fourth-round selection of the Arizona Cardinals, has excelled in his new defensive end position in New Orleans, compiling stat lines of 4-1, 4-0, and 3-2-1 FF to begin the season. He went undrafted in virtually all fantasy leagues heading into the year, so there's a good chance he's still available in your league. Consider him a DL3. DE Jurrell Casey (TEN) - Casey has done next to nothing this year but is coming off a 5 tackle performance and faces off against a Texans offensive line that has allowed five sacks per game so far this year. He's compiled 27 sacks over the last four seasons, so I feel as though he's due. And there's no better matchup right now to get his first sack of the year than this one. ILB Danny Trevathan (CHI) - The Bears have been absolutely decimated at the inside linebacker position, losing both Jerrell Freeman and Nick Kwiatkowski to pectoral injuries within the season's first two weeks. This means Trevathan will be Chicago's sole every-down linebacker on a defense with very limited tackle competition. As long as he can stay healthy, should be a solid LB2/LB2- for the remainder of the year. LB Kendell Beckwith (TB) - In the two games he's played so far this season, Beckwith has graded out as one of the league's best overall linebackers. Lavonte David looks like he's going to miss multiple weeks with an ankle injury and Kwon Alexander is questionable this week with a hamstring injury that kept him out last week. This said Beckwith is a very good bet to play every down this week and put up 6-8 total tackles. WLB Cory James (OAK) - After three weeks, James has established himself as the every-down linebacker on the weak side for the Raiders. He posted 12 total tackles last week with a forced fumble, and given the team's issues at MLB, he should have a fairly clear path to solid tackle production. Consider him a decent LB3- option moving forward. OLB Derrick Morgan (TEN) - This recommendation is for those who play in big play IDP scoring formats. Morgan's been relatively quiet from a fantasy perspective this season but does lead the Titans in sacks with two. And, more importantly, he goes up against a Texans team this week that has already allowed a whopping 15 sacks over three games. I really like his chances for at least one sack, if not two. SS/LB Josh Jones (GB) - Jones created some buzz this preseason as he often looked like one of the Packers' best defensive players. He didn't play much the first two weeks of the season (just 29 total snaps), but Dom Capers' decided to change things up in Week 3 by moving Morgan Burnett to slot cornerback and utilizing Jones in a hybrid safety/linebacker role. The team could opt to change things back once their linebackers get healthy, but I doubt it given how well Jones' played (11 solo tackles, 1 assist, 2 sacks, 3 TFLs). Safety has been a bit of a weak fantasy position this year, so anytime you can snag a guy of Jones' potential, you should do it. There's some risk here, but the upside is well worth a waiver wire claim. CB Terrance Mitchell (KC) - Mitchell, a 7th round pick out of Oregon in 2014, has been "thrown into the fire" as the starting cornerback opposite All-Pro cornerback Marcus Peters. This said it's not surprising that teams have been throwing at him relentlessly. This has translated to great fantasy production as Mitchell has 17 solo tackles, 6 pass deflections, and 2 interceptions through the season's first three games. His fantasy value will likely disappear if his poor on-the-field play continues/he get's benched, but for the time being, continue to roll him out to CB-required leagues or deeper IDP leagues that start three defensive backs. CB Brian Poole (ATL) - Poole has quietly emerged as one of the better tackling options on the Atlanta defense while serving as the team's primary slot cornerback. He has 22 total tackles through three games to go along with one sack and three pass deflections. CB1- moving forward. CB TreDavious White (BUF) - Injuries in the Buffalo secondary have forced White to assume a larger role than expected this early in his rookie season. However, he's responded quite well receiving above-average marks from Pro Football Focus and generating 16 total tackles, 7 pass deflections, and 1 interception so far this year. Teams will continue to test the rookie, so I expect the opportunity to continue to be there for him. He squares off against the Falcons this week so he could have another nice game if he's paired up against Julio Jones.